In the recent week, it saw the devastation of Hurricane Harvey batter the state of Texas, which was horrific as seemingly mother nature or some other force (who knows?) has left the state with a huge disaster to overcome. But, the people of Texas are strong (don’t mess with Texas) and resilient, so we wish them all the best in recovering from this extreme weather event. What the cause of it is? You cannot be sure, can you? Whilst some say climate change, some could argue that it’s just mother nature’s will, while some could say that it’s all apart of some evil weather experiment. Nobody knows. But now, all of a sudden cue Humongous Hurricane Disaster Part II, and what we have is the incoming Hurricane Irma, which has now amassed winds of 185mph and is the biggest hurricane in the Atlantic in recorded history, and for those that were planning an end of summer break in Florida, might just be disappointed. Not to mention already being in harm’s way. Locals across all Islands in Irma’s path and all of Florida would promptly tell you to forget about your planned vacation, if so. 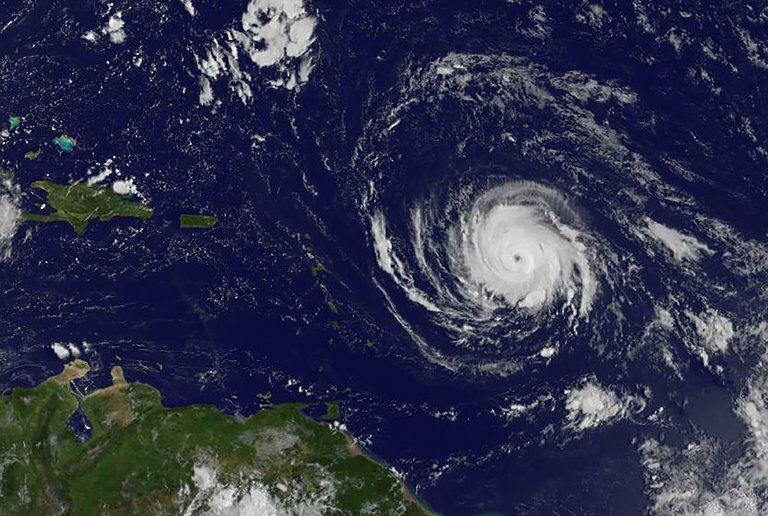 The storm is expected to hit the Leeward Islands tonight or early Wednesday, and from there it will strike Puerto Rico, the U.S. Virgin Islands, the Bahamas and Cuba, and so as we write this it’s headed for the Caribbean Islands and we are now praying for them, wholeheartedly. For live updates in order to keep yourself save, please click here for the latest updates as Hurricane Irma goes full throttle and we warn anyone that thinks it’s a good idea to not heed the warnings of the authorities. The storm is set to bring such strong gale force winds that have never ever been seen before, plus storm surges and landfalls to Islands, but it is yet unclear as to what direction the storm is headed, but seemingly it’s headed to the Florida Keys as Florida Governor Rick Scott declared a state of Emergency on Monday, calling for an evacuation. There’s also the danger of the hurricane heading into Georgia or the Carolinas and all those states or on high alert, watching this storm as it develops. The storm may also wane out into the Gulf of Mexico, which is what most people are hoping for… However, this storm looks set to hit Florida before the weekend, depending on the speed of the storms trajectory and direction. Schools have been cancelled. Puerto Rico is expected to be hit late on Wednesday, with predicted 11 inches of rain, landslides and 23 ft waves. So, Puerto Rico and the Virgin Islands will be hit this Wednesday, Thursday it will be the Dominican Republic and likely Haiti (again), Turks and Caicos on late Thursday to Friday, with Cuba being hit on Friday and into the weekend, with Florida expected to bare the brunt of the storm come Friday and throughout the weekend, as well. The Carolinas and Georgia remain on standby regarding Irma. U.S. residents have been urged to monitor the storm’s direction over the coming days, to ensure their safety, and Evan Myers of AccuWeather said, “This hurricane has the potential to be a major event for the East Coast. It also has the potential to significantly strain FEMA and other governmental resources occurring so quickly on the heels of (Hurricane) Harvey”. Florida Governor Rick Scott, said “‘Hurricane Irma is a major and life-threatening storm and Florida must be prepared. I have continued to be briefed by the Florida Division of Emergency Management on Hurricane Irma and current forecast models have Florida in Irma’s path – potentially impacting millions of Floridians”. Due to the storm, Rick Scott has already called for the evacuation of 67 counties on the southern tip of Florida, plus suspending road tolls and has called on 100 members of the National Guard to aide and help prepare for the major operation of Hurricane Irma. Some 7,000 National Guards will report on duty on Friday ahead of the expected timing of Hurricane Irma making a landing on Floridian shores. The Miami-Dade County Mayor said that people of Miami Beach should be ready and set to evacuate as soon as Wednesday evening. The Miami Dolphins NFL game on Sunday has also been cancelled. Supermarkets have been running out of supplies already across all locations in Irma’s projected path, so you know this is some very serious stuff indeed. We encourage everyone to keep themselves safe and listen to the news to do as the authorities say. These storms can pick up speed, alter direction and even muster up further might and force as they go on, but hopefully this storm (we pray) will dribble out and disperse to calmer winds, but right now it is looking very unlikely. Richard Branson reportedly refused to move from Necker Island, read here, which is probably a bad idea, so don’t be like Richard Branson in this instance and try to defy the storm, but just do as your told and so do as Simon says. We wish everyone safety and minimal damage. Let’s hope Irma doesn’t prove to be as devastating as Harvey. Our thoughts are with the many people in Texas after Hurricane Harvey, plus now with all the people across the Caribbean, Puerto Rico and also with all our Floridian friends that are set to be caught up in this messy weather event. May god bless you all and please stay safe.